These remarkable, top selling relaxation CDs are sold with a music usage licence, allowing you, the therapist, to make commercial use of these excellent recordings. Please refer to Terms and Conditions for details of Licence. The albums are produced and mastered to the highest standards at Hypnoke International’s Recording Studios. Each album has 3 tracks lasting a total of 1 hour, at 60 beats per minute, providing you with some of the most sensuous, meditative and spiritually uplifting relaxation music you will probably hear anywhere. Professional film composer Paul Honey has created music that transports you into a world where the stresses and tensions of everyday life disappear. Whether for relaxation, recording purposes or client sessions, forget everything for an hour or so, with COLOURS Vol 1 and 2, as they create a wonderful world of calm, peace and tranquillity. 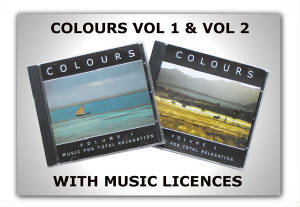 Colours Vols 1 and Vol 2 relaxation music are sold with a music usage licence that allows you to legally record and distribute up to 50 copies of your own CD’s. Listen to the MP3 samples below.